The Columbia Chapter of the Western Music Association is up and running…at a pretty good rate, it seems! Their website is www.columbiawma.org and you can reach their Facebook Page at http://www.facebook.com/?sk=lf#!/pages/WMA-Columbia-Chapter/227636313934331. Congratulations to you all! Looks like you are all working and having fun! Congratulations Susan Matley (Cimarron Sue)! “Show Me Mister” was one of two “Finalists” in Western Writers of America’s 2011 Spur Award for “Best Western Song!.” What a great song it is! One of the greatest “women’s rights” stories coming from the old west! Prairie Rose was quite a gal and made her point quite well in Cheyenne, Wyoming in the early 1900s! And Susan Matley did a superb job of turning the story into a song and presenting it! It’s cute, fun, entertaining and educational! One for the girls!!! 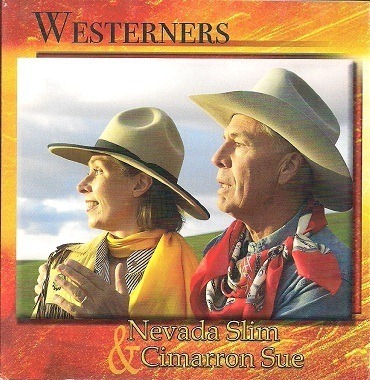 Nevada Slim and Cimarron Sue’s latest CD, “Westerners” is one you need in your collection. In addition to “Show Me Mister,” Susan also wrote “The Cowboy That Made Me Blue,” “Common Wisdom,” and “Home To You.” Bruce Matley offered his originals, “Cowboy’s Farewell,” and “The Ranch That I Can’t See.” There are a number of other wonderful songs for a total of 17 tracts. I don’t need to tell you about the singing and musical talent of Nevada Slim and Cimarron Sue, you already know that. This CD has a great variety of good music and you’ll love it! For more information about the duo and the CD log onto www.nevadaslim.com. It’s my pleasure to have these folks as friends! See ya down the road!